This hearty deep dish meat pie is guaranteed to be a hit. It's full of flavors with the addition of onions and green peppers and your choice of McCormick taco, spaghetti or chili seasoning. It's perfect for your Christmas brunch table and great for a game-day party. Brown beef in skillet, drain. Add green peppers and onions to skillet, cook five minutes. Return beef to skillet. Stir in water, tomato paste and seasoning mix. Cover and simmer 10 minutes. 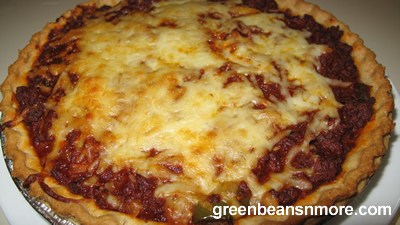 Sprinkle 1/2 cup of cheese in bottom of pie shell. Spread 1/2 of meat mixture over cheese. Sprinkle another 1/2 cup of cheese and top with remaining meat mixture. Bake 15 minutes. Sprinkle top with remaining cheese and bake until cheese melts.